For our second week in Norway, more old friends came over to join us for fun and games. Matt and Lisa, George and Diane, Scott, Laura, and her friend Carolyn joined us for the first time. We made the most of what the weather gods threw at us during the week, and they pretty much threw in every kind of weather you can imagine! Day one, cue up the wind. Gusts srong enough to blow us over, we made it short and sweet. Approaching our high point of the day, bracing for a transition from hell! Day 2, we caught a break and made hay while the sun shone. 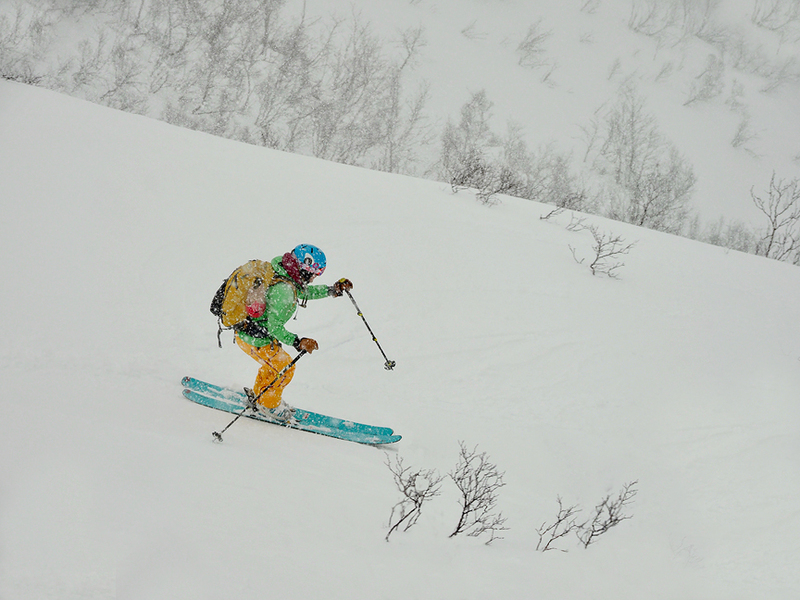 More skinning up toward Varden. Almost too warm, what a contrast from the day before. We get ready for a quick side trip to the summit. The view isn't too shabbt at all! Laur and Carolyn on top. A quick lap down the back side in lovely snow. The weather closing in again for our trip down. An abortive attempt at a peak near by the lodge, ended in rain and sticky snow. Heading for the barn! Matt Hyde photo. Tourist attractions beckon as a safe and sane alternative. ... and if you don't like the weather, wait half an hour! Back in the lodge, it's time for waffles, or maybe a happy half hour before sauna time. George and Diane settle in. Another sunny morning, we headed up Torskman. The weather was forecast to change, and change it did. Sun breaks and the coming storm. An exceptionally wet and windy storm gave us an excuse for a driving tour for a change. A sight you don't see just anywhere! Fish heads out to dry. Our destination for this day; the local surfing beach where we knew we would find waves, wind and weather. Breakers piled up on top of each other. The offshore wind hurling the water right back out to sea. A lunch stop in a local eatery. Back at the lodge as night falls. Our last day, heading out on the trail once more. Wetness, but still smiling (or grimacing). The air cleared for us soon enough. And the wind picked up as we approached a col over "interesting" snow conditions! Yes, that is ice. OK OK, enough!!!! Another grisly transition, with only one pack cover stolen by the gusts (Kathy's, ashamed to say). After a nice buttery descent into the trees, we went back up for a second lap. Surprisingly good snow conditions in the lee of the crest. Thank goodness for good foul weather gear. Until next time, thanks to all the crew! Laura Kreitler photo.